What is the difference between the Vancomycin "CL" and "Kel" models which come with the program? You may analyze a single trough, a single peak, or a random level drawn at any point within the dosing interval by selecting the single point Bayesian method. Why does the creatinine clearance from the Kinetics© program differ from what I calculate by hand? Must I always use steady-state analysis? For example, my patient received two doses of 1gm vanco q12hr, and for some reason the dose was decreased to 600mg around which levels were drawn. Version 2.1.8 of Kinetics© added non-steady-state Bayesian analysis for the one-compartment model. If you wish to use the more aggressive 7mg/kg dose utilized by Hartford, you may edit the model. Please see the help file for more information on how to use the model editor. In many respects the nomogram approach to aminoglycoside dosing is just as simplistic as giving 80mg Q 8 hours to all patients with a "normal" serum creatinine. Instead, all patients should be individually dosed in order to maximize therapeutic efficacy and minimize the risk of toxicity. The patient should receive a large enough dose to produce a peak level that is 8 to 10 times greater than the MIC. The dosing interval should then be extended to produce a trough less than 0.5 mcg/ml in order to provide a washout of aminoglycoside in the renal tubule thereby reducing toxicity. If a significant percentage of your patients are flagged as outliers, then there is a good possibility that the model you are using is not appropriate for your patient population. This is a situation where the population analysis tool will be helpful. Each time you print a consult based on serum level data, the calculated pk parameters are saved. This data is a virtual gold mine of information about your patient population. With this tool you can derive a model better fitted to your patients. We use a different monitoring protocol that what appears in the pharmaceutical care plan. Is there anyway to change this? Yes, that's the goal of this program, to give you the ability to customize it to fit your practice. The Edit drug model function is accessed via the drop down menu tree or by the keyboard shortcut Ctl+E. The care plan field is free form text entry, you can enter anything you like in this field. The care plan function in Kinetics© is basically just a skeleton that you can expand on because plans will differ depending on the practice setting in which the program is being used. Acute care, home care and long term care all have different monitoring parameters and schedules. How do I enter my own dosing table? Therefore, you must exit Kinetics before installing an update. Web update will not proceed with the install step until you close Kinetics. After you have closed the Kinetics program, click the Install updates button to begin the update process. Why doesn't the Kinetics© program let me enter a peds patient? As stated on the home page on the website, Kinetics© is for adults only. Also, please read the help file (press the F1 key) the patient data limits are clearly stated there. APK© (Adult and Pediatric Kinetics) includes support for pediatrics. If you are using the two point method, the dosing interval is only used to extrapolate the pre-dose trough to simulate the after-dose trough. Therefore, in the Kinetics© program, instead of entering the "ordered" interval, you would enter the time between the last dose and the sample dose. Using our same example, if the nurse is supposed to be giving gent 80mg Q 8 hours, at 6-14-20, but the sample dose is given late, at 1600. In the Kinetics© program you would enter an interval of 10 hours. Again, this is because the interval is only used to extrapolate the pre-dose trough. The Kinetics© program is deceptively simple in this area. When you hit a snag like this, you have to stop and think, and that's the downside to having such a simple interface for entering levels. The other alternative, and the one taken by most other PK programs, is to have you enter each and every dose and the time each dose was administered. This approach punishes you each time you have to enter a simple set of levels. The Kinetics© program only makes you work hard in a problem situation. Can I use a 1-compartment Vancomycin model instead of the 2-compartment model? Beginning with build 1.1.7, the Kinetics© program now includes both 1- and 2-compartment Vancomycin models, you choose whichever model best fits your practice and your patient population. A useful feature of Kinetics© is that the drug models are not hard-coded into the program. You can edit any model to better fit your patient population, you can even add your own 1- and 2- compartment Bayesian models for any drug and for multiple patient populations, a "Swiss army knife" for pharmacokinetics if you will. Vancomycin is not a predictable drug, I've had repeat patients with the same creat & weight, for whom I've recommended the same dose but the levels were completely different each time. Read this vancomycin case from my files. The default 2-compartment model is based on Lake and Peterson's method. I've been a fan of Lake and Peterson's method since their first paper in 1984. L&P's is the only published vancomycin dosing method which has been independently verified by other researchers. Before you choose a dose, examine the pharmacodynamics of vancomycin. Because it is a cell-wall active drug with a short post-antibiotic effect, the trough level must remain above the MIC in order for the bactericidal activity to continue without interruption. Therefore, it is more logical to give smaller vancomycin doses more frequently with the goal of lower peak levels and higher trough levels. The 2-compartment model that comes with Kinetics© is intended to do just that, i.e., recommend smaller doses administered more frequently. However, there is still the popular method of giving large 15-20mg/kg doses over extended intervals, every 12, 24, 48+ hours. If that is your preferred method, and you draw your peaks 1 or 2 hours after the dose, then you will get much better results with the 1-compartment model. This apparent dichotomy is understandable given the variability in vancomycin kinetics and the divergent views on its dosing. Please realize that there is no easy answer to the dilemma of vancomycin kinetics. My advice is, don't hang your "PK hat" on your ability to predict vanco levels. I've been looking for twenty years and have yet to find a method or model that accurately predict vancomycin levels in all patients. I want to target a Vancomycin peak of 35, the program will only let me change the trough, why? The Kinetics© program offers you the choice of either a 1- or 2-compartment Vancomycin model. The 1-compartment model allows you to enter target peak and troughs, however, the 2-compartment model targets a trough level only. Choose the model which best fits your practice and your patient population. Please realize that there is no consensus on vancomycin dosing. If, in your practice, you administer "large doses less frequently" (eg, 1g Q 12-24h) then the 1-compartment model may be more appropriate. If you tend to use "small doses more frequently" (eg, 500mg Q 6-8 h) then the 2-compartment model may be more appropriate. Regardless of which model you choose, please understand that vancomycin is not a predictable drug. In other words, don't stake your pharmacokinetic reputation on your vancomycin level predictions. Is it possible to get a report which lists the number of consults a specified user may have completed? Under report type, select "Consults"
Under Create consult report, select "Consultant"
Does Kinetics© interface with our Pharmacy Information System? Kinetics© may be interfaced with a PIS, using our open interface specification. Please contact your PIS vendor to request implementation. Please explain the information displayed in the "Calculation Detail" section after Bayesian serum level analysis. The "Calculation Detail" section displays several parameters which are used to evaluate the accuracy, reliability, and expected performance of the Bayesian derived model. What is my password for setup and drug model editing? The first time you access the edit drug models function it will ask for a password. Before saving the password, the Kinetics© program will ask you to reenter the password to confirm it. Kinetics no longer displays the Log-in window upon startup. The application appears to start (per task manager it is running) but there is no Log=in window displayed. By default Kinetics saves the last screen position on exit. If you have multiple users with different monitor settings or are switching between laptops and desktop monitors of various sizes, windows sometimes sets the start position off screen. To fix just turn this feature off in the setup dialog. On the "general" tab there is a check box "save window size and position", uncheck that box to turn off the save feature. Why does the patient's birth date change to a 2-digit year even though I enter a 4-digit year? It locks up and won't let me enter the patient data! Select Short Date style = MM/dd/yyyy, or, if British system utilized, dd/MM/yyyy. Build 1.1.6 (32-bit only) added an automatic date formatting function on program startup. Each time you start up the Kinetics© program it checks the current Windows date format and, if necessary, changes it to a 4-digit year. However, because Windows is an unstable and unpredictable platform, you should check the date format in Control Panel if you are having date entry problems. To obtain the latest build please check the Downloads page on this site. I just downloaded 1.2.4 and there are no drug models in the program and we can't access any dosing programs, help! In the latest versions, patient entry is separate from drug model selection. While in edit or add mode your only options are to "Save" or "Cancel", all other functions are disabled. You must "Save" or "Cancel" the current patient before the drug model selection (or any other function) becomes re-activated. There are several visual clues on the interface meant to help you, the toolbar icons are "greyed-out", all the databar icons except Save and Cancel are "greyed-out", the drug model selection box is disabled, the tab titles are "greyed-out". The most notable clue is the status line to the left of the data bar. You cannot select a drug model (or any other function) while you are "Adding" or "Editing", only after you click "Save" or "Cancel" do these functions become reactivated. Only when the status line says "Browsing" are you able to select a drug model. In the older versions it was possible to accidently change patient data while browsing the records. This change improves the stability and integrity of the patient database. We need to reinstall Kinetics© on our new computer, how do we transfer our current patient data and settings from our old computer? Install Kinetics© onto your new computer from the original installation CD. When we print reports, the preview window is blank. The reports print out okay, the only problem is we are unable to preview them before printing. There is a known issue with dDoc on some video cards (driver problem) where the card is set to 24-bit or 32-bit color. This issue causes a *blank* preview window to display initially. Clicking on the window to resize the preview will display the previewed document. Also, clicking the print button will print the report just fine (it's a video-only problem). One work around for this is to set the color depth in the video display settings down to 16-bit color (this is a faster mode anyway, with very little difference in video quality). On Windows 7 (or 8, or 10) the F1 key for help is not working. Also we cannot access Kinetics© help via the Help button. Does Kinetics© run on 64-bit Windows 7 (or 8, or 10)? This is usually caused by improper Windows or Netware folder permissions. Users must have "full" read and write permissions on ALL program related folders on the workstation and the server. You must have administrator privileges to change permissions. 'Error 91' is a nonspecific error which is usually caused by a missing or incorrectly installed component required by Kinetics©. If this is a new install, then there was an error during the installation. Please reinstall from the CD. Also, some antivirus programs may interfere with the installation, please temporarily stop your antivirus program. If this occurred after an upgrade, then please download and install the "Complete Update Package". If this is a new problem on a previously working PC, then another software application you recently installed may have corrupted the Windows registry. To fix this problem: first re-install Kinetics© from the original install disks or CD, then download and install the "Complete Update Package". If this occurred on a Windows XP computer with more than 768MB of RAM, then please download and install the "Version 2 Upgrade Package". If the error persists, please download the Kinetics component checker program. Clicking the "Register" button on the component checker usually fixes the problem. If you believe the Kinetics database was corrupted, e.g., following a server crash, do not attempt to repair the database with desktop Access. Access will irreversibly change the structure of the Kinetics database, rendering it useless. Instead, please download the Kinetics database repair tool. This problem usually occurs when some other software application corrupts the Windows registry or installs an incompatible version of a control, causing Kinetics© to be unable to load and use the control. Also, please download the Kinetics component checker program. The easiest way to fix this problem is to re-install Kinetics© from the original install disks or CD, then download and install the "Complete update package". If the error persists, please download the Kinetics component checker program. This problem usually occurs when some other software application installs an incompatible version of a shared file, causing Kinetics© to be unable to load and use the file. Please download the Kinetics component checker program. This problem occurs because the Microsoft Jet 3.0 database engine used by Kinetics© 1.X.X. does not work within the XP memory manager. The reason for this is, Microsoft has dropped support for the Jet 3.0 engine and is no longer ensuring its' compatibility with newer versions of Windows. Please download and install the "Version 2 Upgrade Package". To obtain the latest build please visit the Kinetics download request page. Error 3031 "Not a valid password. Module: RSOpen"
You are attempting to open the latest database with an old version of Kinetics. Download and install the Kinetics update patch to fix the problem. Error 3041 "Can't open a database created with previous version of your application"
If you have the original install disk, re-install Kinetics©, then download and install the "Complete update package". This is another folder permission issue with Windows NT4, 2000 and XP only. 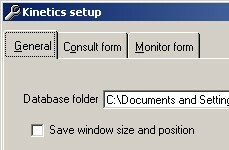 Change the user permissions for the folder containing Kinetics© to allow Write permissions for all users. Error 3163 "Data too long for field"
The problem occurs if you would happen to enter Patient, RPh, or Physician names greater than the maximum allowed length. These are the same field restrictions as in the DOS version, however in DOS the fields automatically truncate, in Windows it crashes! This is what Microsoft refers to as "an undocumented feature". Build 1.1.4 and later has code to prevent this error. To obtain the latest build please check the Downloads page on this site. "The data binding DLL, 'VB5DB.DLL', could not be loaded"